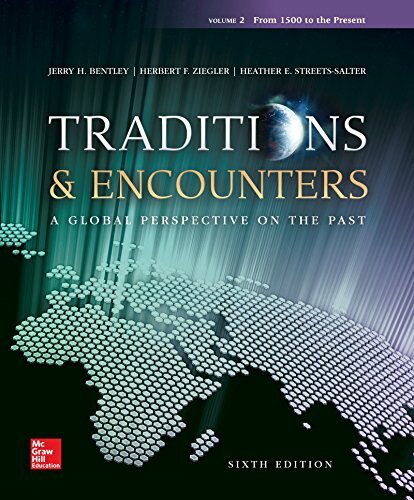 77504917 -Traditions & Encounters offers an inclusive vision of the global past―one that is meaningful and appropriate for the interdependent world of contemporary times. Given the diversity of human societies, gathering and organizing the sheer mass of information in a meaningful way is a daunting challenge for any world history survey course. The seven-part chronological organization enables students to understand the development of the world through time, while also exploring broader, big-picture thematic issues in world history. Through new and revised chapter-level and part-level features, the hallmark twin themes of traditions and encounters emerge in greater clarity than ever before in this sixth edition. As a result, students have resources that enable them to move beyond the facts of history and examine the past critically, analyze causes and effects, and recognize similarities and differences across world regions and time periods. By digging deeper into the implications of world history’s stories―not just the who, the what, and the where, but also the why and the how―students can make sense of the human past.